This schematic diagram shows the major features of the renal corpuscle. The renal corpuscle is formed when a mass of glomerular capillaries gows into the blind ending of a nephron. 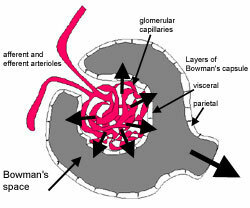 The nephron encapsulates this mass of capillaries, and it invaginates to form Bowman's capsule. (see diagram). The epithelial cells on the inside (visceral layer) of become closely associated with the capillaries. The outer layer of epithelium is called the parietal layer. Blood is filtered out from the capillaries through the visceral layer of epithelium into the capsular (Bowman's) space, and can move out from here into the proximal convoluted tubule. This section shows a renal corpuscle. See if you can identify Bowman's capsule, and the renal corpuscle. It is helpful to remember that this is a cross section through the capsule, which is in reality an ovoid structure. This diagram shows how a representative visceral epithelial cell is wrapped around a capillary. These epithelial cells are known as podocytes, because of their unusual shape. Primary processes radiate from the cell body, and form branced secondary processes that are called podocyte feet that extend onto the basement membrane. First: The glomerular capillaries do not drain into veins, but into an efferent arteriole. - Both afferent and efferent arterioles have smooth muscle cells in their walls. - Contraction of this smooth muscle, maintains a relatively high hydrostatic pressure along the length of the capillaries. Second: the glomerular capillaries are fenestrated, which enables blood to be filtered out. This diagram shows how blood passes out from the fenestrated capillary through the basement membrane into the podocyte, through the feet. These 'feet' interdigitate with those from other podocytes, to form filtration slits that are only 20 to 30 nm wide. A scanning EM showing the primary foot processes of the podocytes. charge (Negative charge of heparan sulphate proteoglycan in the basement membrane repels negatively charged proteins such as albumin).